The Age limit For candidates who are applying for the HPPSC Language Teacher( Post Code-636) should have the age limit 18- 45 years relaxation available for the reserved category candidates for 5 years. Studies, English, and General Hindi of Matriculation. 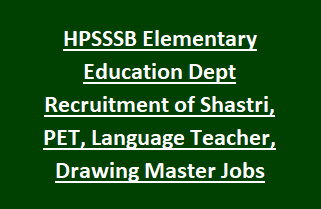 The candidates who are eligible for the HPSSSB Jobs Can apply online through the official website of Himachal Pradesh SSSB @www.hpsssb.hp.gov.in/hppsc/. notification carefully before applying HPSSSB Jobs.